The eighth round of the Formula Renault 3.5 Series held in Le Mans, France this weekend resulted in a 13th place finish in the first race and 14th place in the second race for Jazeman Jaafar. The first day of practice saw Jazeman and the Fortec Motorsport team work on set up for qualifying and the two races. With 22 laps completed over the course of the first session, Jazeman had posted eighth quickest lap and with 19 laps in the second session he was 11th fastest of the field. Saturday’s qualifying for the first race was held in dry conditions. Jazeman turned some quick laps at the start of the session, topping the time sheets soon after the start of the session and at the mid-point. The defined track limits at the Le Mans Bugatti circuit caused problems for most of the drivers, including Jazeman, with the stewards deleting lap times when drivers were deemed to have exceeded the track limits. With Jazeman penalised for his quickest lap, he finished 15th fastest for an eighth row grid slot for race one. Jazeman had a good start for the first race, moving up one position by the end of the first lap. He maintained position through the mid-section of the race, improving by another place in the closing stages to finish 13th. 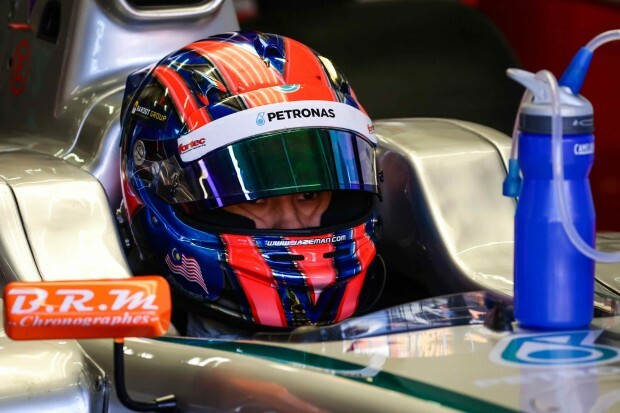 The second qualifying session produced a better result for the young Malaysian driver, with eighth quickest time posted on his final lap of the session, to start on the fourth row of the grid for the second race. Jazeman dropped a place at the start and a safety car period after five laps of running slowed the pace for all the drivers. A couple of laps later racing resumed, but Jazeman struggled with pace and was unable to make up any ground. Stopping on lap 9 for his mandatory pit stop, the PETRONAS talent development programme driver returned to the track in 15th place and held this position to the chequered flag. Jazeman said of the weekend, “It’s been ups and downs for me this weekend, but mainly downs. We worked hard to find a good balance with the car in the practice sessions but I wasn’t able to translate that into a good qualifying spot. It’s a difficult track to overtake on as it’s so narrow, so I really struggled to move forward. My second qualifying session was much better and I was pleased to have posted a top ten time. However it didn’t pan out in the race with a pitstop which wasn’t the quickest and that put me down the order. My pace was quite good, but I just struggled to find enough to improve on my position. All my focus now is on the final round in Jerez and my aim of finishing the season with two good races. Jazeman returns to Formula Renault 3.5 Series racing action in Jerez in three weeks time.